Ornamental grasses are easy to care for and add a beautiful touch of prairie flair to your landscaping. The below list of ornamental grasses are suitable for the climate and growing conditions associated with USDA hardiness zone 5b, which includes DuPage County, IL. Now is the perfect time to learn more about the different types of ornamental grasses because spring and fall are the two best times of the year to incorporate them into your backyard landscaping. We’ve made a list that includes ten of our absolute favorite grasses to use in landscape designs. Blue Oat Grass: This semi-evergreen grass shows off silver-blue blades that form ornamental clumps and combine well with other ornamental grasses. Airy, beige to light brown, terminal panicles show around mid- to late summer. Blue oat grass is attractive as either an accent or a centerpiece, and is ideal to use in rock gardens. Blue Fescue: One of the simplest of the ornamental grasses to care for, blue fescue will thrive in a wide range of conditions — although, well-drained moist soil in a full sun location often produces the best results. Use blue fescue as a landscaping border or as a bright accent to other perennials. Given the plant’s slender blades, it provides contrasting texture for leafy plants and will thrive for several seasons in containers or planters. Sioux Blue Indian Grass: Arguably one of North America’s most beautiful native grasses. Sioux Blue’s upright blue stems project golden brown seed fronds. 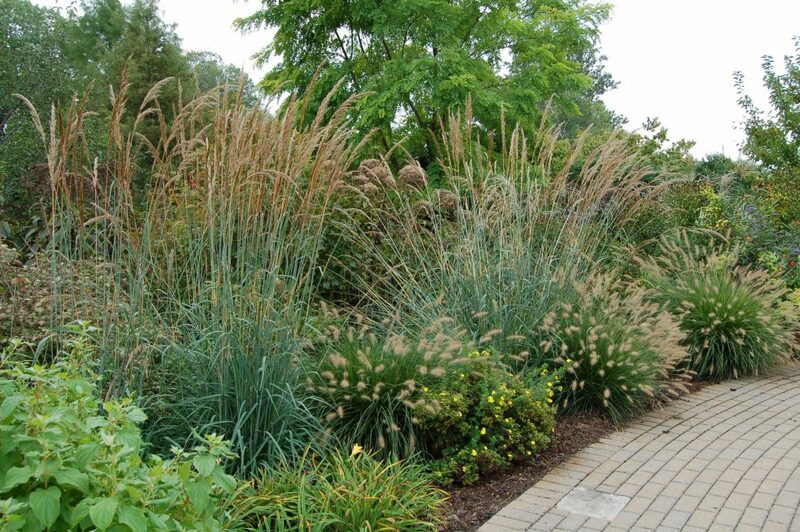 This ornamental grass provides remarkable contrast with grayish-blue foliage and chestnut plumes. You’ll find it does best in dry, infertile soils, but is highly adaptable. Sioux Blue can even self-seed in optimum growing conditions. Maiden Grass: Attractive clumping ornamental grass with fine-textured, silver-green blades that turn golden-bronze after first frost. Maiden grass is perfect for shrub or perennial beds, or when used in groups as a screen. Grow it where you’ll enjoy the effects of elegant foliage when it turns green or golden near the end of summer. Perfect for border or contrast against patches of green groundcover, or in wild gardens and dry streambeds, where it blends nicely with the soft hues of warm-colored stone. Dwarf Fountaingrass: An attractive grass highlighted by fluffy, buff-colored plumes that arch above the lush, green fountain of foliage. In the fall, the foliage turns a rich golden russet color. Dwarf fountaingrass creates a unique texture contrast when used among shrubs or as a backdrop in a perennial bed. You’ll find that it does well in nearly any type of soil; however, for best results, it should be planted in fertile, well-drained soil. Place is areas receiving full sun if possible because these plants prefer warm conditions. 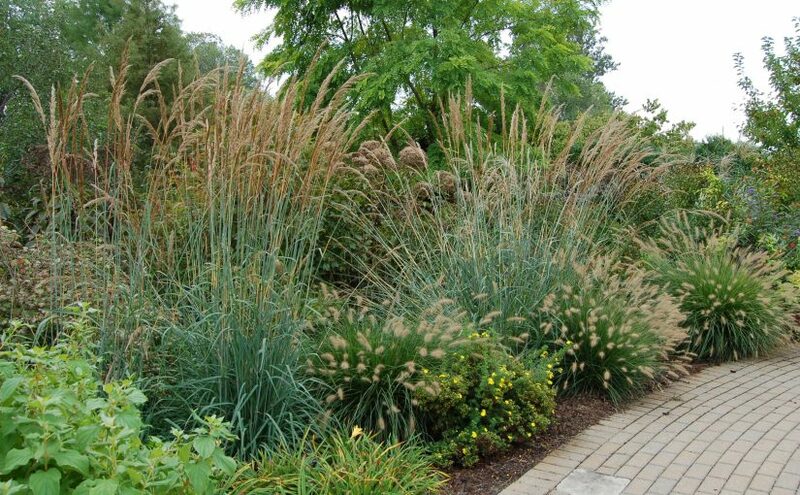 Switchgrass: This hardy ornamental grass prefers full sunlight and moderate to moist soil. Switchgrass is a perennial that grows approximately 3 to 6 feet tall with stiff upright clumps and airy flowers of pink, red or silver during the midsummer months. Switchgrass is a great choice for landscaping near water gardens or prairie gardens because it tolerates soil quality extremes. The bonus is that it also attracts birds and reseeds each year. Morning Light Miscanthus: Morning Light has a beautiful billowy texture, silky tassels, and pink blush to straw-beige plumes. This grass is good for hot, dry areas, and is deer resistant. Cut foliage back in late winter before new shoots appear. Divide in late spring when needed. Benefits from a well-drained winter site. Golden Hakone Grass: Golden Hakone grass is also occasionally referred to as Golden Japanese Forest Grass. The plant has bright yellow foliage about 1/2″ wide with green stripes, and during the fall months it becomes tinged with pink and red. This is one of the few ornamental grasses that will tolerate partial shade. Plant Golden Hakone in moist, but well-drained soil. The only maintenance required is to cut the previous season’s dead leaves back in the fall, late winter or early spring. Red Switch Grass: Another very easy ornamental grass to grow in full sun. Does well in any type of soil from sand to clay. The plant forms a dense mass of blue-green leaves that turn burgundy in early summer. Purple panicles make an appearance above the foliage in late summer. You’ll find that Red Switch Grass is ideal for residential gardens, borders, or container gardens. Now that you know more about the different types of ornamental grasses you can incorporate into your landscaping, you can call Landscape Creations at 630-932-8966 for a custom landscape design that includes these easy-care plants.